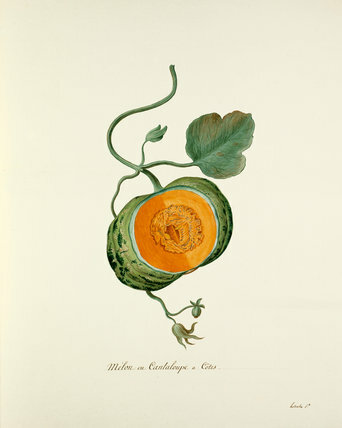 Watercolour of Cucumis melo (Cantaloupe Melon) by Pierre François Ledoulx, a painter of flowers and insects from Brussels. Taken from volume I of ‘Regne Vegetal' which contains botanical drawings by at least four identified artists. 'Regne Vegetal' was compiled by Baron Joseph van Huerne and originally bound as a set of 4 albums. Two of these volumes are in the Lindley Library collections.